Your smile wouldn’t be your smile without healthy gums. The way your skin supports and protects your organs and bones, so too your gums support and protect the connective tissue and bone structure that hold your teeth in place. Without healthy gums, you’re smile is at risk. To help you maintain your beautiful smile, the Lakewood Dallas dentist office of Vanderbrook and Hoppe would like to offer some advice on how you can take better care of your periodontal health and avoid gum disease. At the root of gum disease is a substance that accumulates daily in all of our mouths. Called plaque, this sticky, colorless film builds on your teeth and contains millions of bacteria. These bacteria can lead to gum disease and tooth decay if they are not removed with regular brushing and flossing. When we eat, the bacteria in plaque feeds on the sugars in food and excrete acids that can erode tooth enamel. If not removed, then these acids eventually cause a cavity. Likewise, plaque that is not removed by daily brushing and flossing will gradually harden into tartar. As tartar collects along the gum line, it becomes much more difficult to remove. Eventually, the combination of plaque, tartar and bacteria can lead to gum disease. In its early stage known as gingivitis, gum disease is recognized by red and swollen gums that may bleed when you brush your teeth. 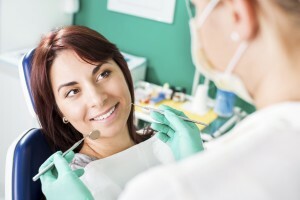 At this point, gum disease may be reversible with good oral hygiene at home and a professional cleaning with the general dentist Lakewood Dallas turns to for complete oral health care. Left untreated, however, gingivitis can advance to become periodontitis. This more severe level of gum disease happens when the bacteria in plaque and tartar infect your gums and the supporting bone tissue underneath. As a consequence, gums begin to recede and pull away from your teeth, causing enlarged gums that can fill with infection that begins to destroy bone tissue underneath your gums. Ultimately, periodontitis can lead to tooth loss. To learn more about how you can have healthy teeth and gums, or to schedule a visit with the dentist Lakewood Dallas relies on, contact the dental practice of Vanderbrook and Hoppe. We conveniently serve patients throughout the DFW metroplex including Lakewood, East Dallas, North Dallas, Richardson, Garland and Mesquite.